Early morning sunshine warmly lights up Thunder Mountain, or as more commonly known, Capitol Butte turning its coconino sandstone a gleaming gold. 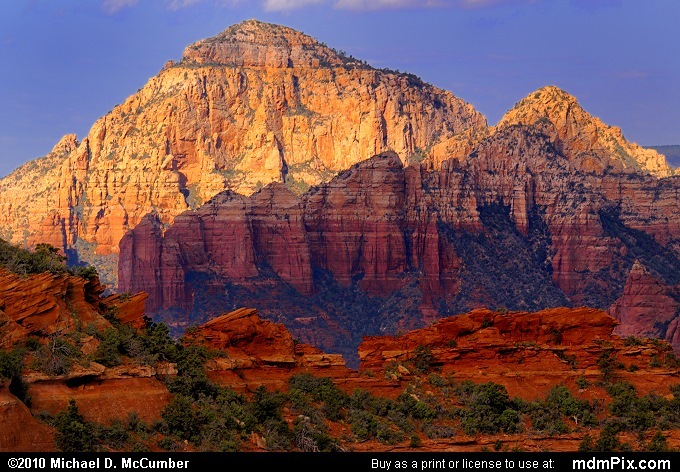 The sunny background scene is a contrast to the shadows cast against both Sugarloaf Rock and the foreground's red schnebly hill sandstone rock of Mitten Ridge. Thunder Mountain features prominently in the skyline throughout Sedona, Arizona.